Hello! I'm back with an unshared swatch while I prepare for a new year of nails! 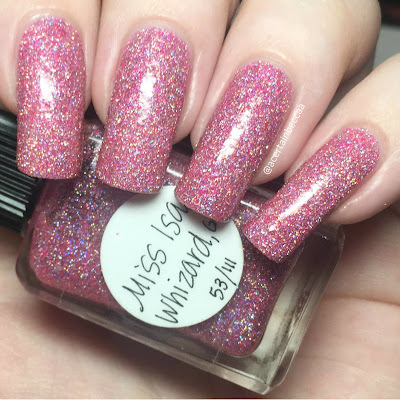 The polish I have to share is Lynnderella 'Miss Isa Whizard, GF'. This is the first Lynnderella polish I have worn, although I'm sure I do have another one hiding in my helmers somewhere! I picked this up from a destash after being drawn to the name - as it reminds me of my boyfriend. Read on for my swatch and more info! 'Miss Isa Whizard, GF' is a clear base with both pink and silver holographic microglitter, as well as slightly larger neon pink microglitters. The formula is smooth and easy to apply, especially considering the amount of glitter. It has good coverage on the first coat, and is opaque after a second. This does dry textured. 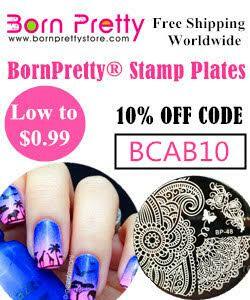 Below is two coats without topcoat. If you're not a fan of a textured finish, this can be smoothed out with topcoat. Below is two coats with a single coat of topcoat. What do you think? I may have bought this mainly for the name, but I do love it! Anything pink and glittery is a winner in my books. I also really love a textured polish, and enjoyed this both with and without topcoat. I'll have to pull out my other Lynnderella polish and see if I love that one too.